This morning Mimi invited me over for oatmeal and coffee in her patio. Mimi enjoys tossing peanuts out from where she sits in the patio to the yard. There are two jays, and they swoop down, find a peanut then hide it in trees and other places. It's a good time watching these birds! I stayed for an hour chatting with Mimi. That's how my days go. Doing this and that. My time just flows. And I always am surprised how late it is when I finally get myself in gear! I purchased Box Van on October 13th. Ever since then, every single day [Except on weekends], I have tried to buy a liability insurance policy with no success! Progressive Insurance, my insurance company, does not write this kind of policy themselves. They use their independent agencies to do this. I have been in contact with one of those independent agents. No success there either. Today I called Progressive, and explained what I needed. Progressive gave me the name and phone number of two independent agents. I phoned the first independent, and the phone number is wrong. I phoned the second independent, and that independent was having computer connection problems. I am now phoning back to Progressive for another try!!! George, great place to mount the propane tank. Same place as regular rv's You may be able to get one from Pelland. A good place for a built in bottle from a salvage yard. The portable gas bottles need to be upright to work. I read a Blog about a person who got a wrecked RV for almost free and salvaged tons of stuff off it which he used to build a Tiny House. He reused the fridge, stove/oven, microwave, air conditioner water heater and even the door! "The portable gas bottles need to be upright to work". Just remember a vertical tank can not be used horizontally, only stored that way. You don't want to store a vertical cylinder on it's side. If the emergency vent gets submerged in the liquid propane inside the tank, it will vent liquid propane in an emergency, not vapor. Liquid propane creates 270 times as much vapor, so even a small release of liquid propane can be catastrophic. I did not write in my Blog about storing my propane bottles on their sides. All that space (other side too?) would be a good place to make a rack to store house batteries too. They are heavy so I'd watch the balance. 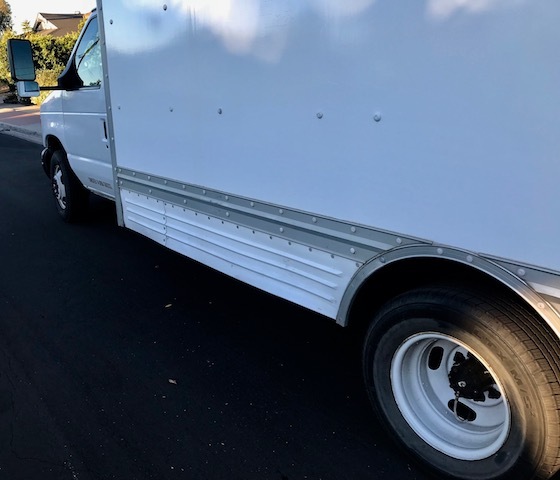 Hi George... with the length of the box you might review YouTube box van conversions and look for ones where they reserved about 2 - 2 1/2 feet at the rear for their propane tanks. They build a wall and put a door in it. This allows verticle storage of the propane tank between the built door and the original back door -- which is retained. Easy to remove to refill and safer. They drill vent holes in the floor for fumes. This space can also be used for storing the generator and fuel for it. Some put the new door in the center and some offset it, depending on planned use and storage needs. Just a thought. Have fun! I want to put the propane tanks in the place where I Blogged about putting them. Just keep jumping thru the hoops and everything will work out. Has this been an impulsive purchase? Yes! Box Van is an impulsive thing for me to do! Uh oh! Just a curve in the road. What are you commenting about? 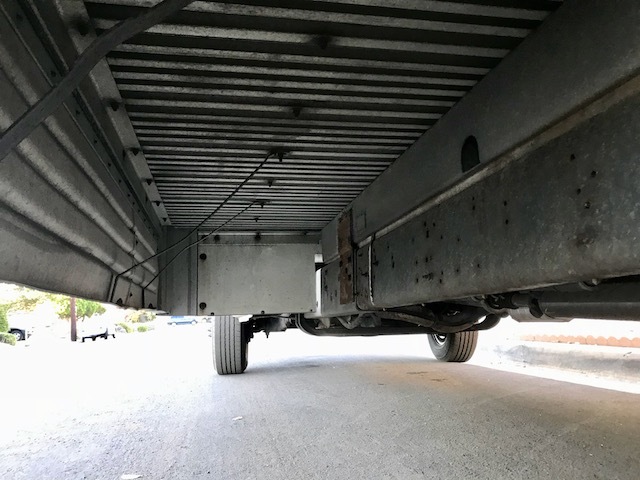 The inability to find a company to insure your box truck. Just a curve in the road. Specifically provided a topic for you to google in an attempt to assist you. As of this morning, Box Van is insured. I might just do that! And while I am at it, make up a VIN to go along with my lie. Hi George.... I think my confusion regarding your propane tank placememt is because a 20# tank is 18 inches high. 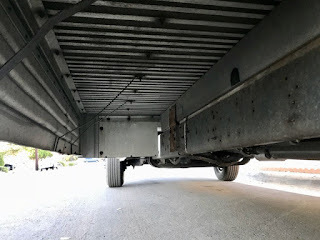 Assuming a storage rack base might be an inch thick, and you might want 2 inch clearance at the top, that means 21 top to bottom space for storage where you indicated... it just did not look like you would have 19 - 21 inches to work with vertically, and also have adequate road clearance. Could that be why other well meaning readers thought you were planning to mount the tanks on their side? Just wondering. There is a 30" distance between the between the bottom of Box Van's floor and the road. I was just now under Box Van taking that measurement. This location is a very poor choice for me. The propane tanks will be very hard to remove being mounted so far inside. I was sooooo surprised when my phone rang and it was you!! Thank you so much for arranging for an insurance guy for me in Southern California! You are one hell of a cool guy! Maybe get a horizontal tank like cane with my Winnie. Probably could find a salvaged one. It would fit perfectly. Trailer hitch, then a cargo carrier, and tanks can sit there. Harbor Freight.